I'd always found the Trossachs a disappointment. Long trumpeted as a beautiful area, this was the earliest tourist spot in Scotland. Victorian entrepreneur Thomas Cook brought his first Scottish tours to the Trossachs. People clamoured to see the area that Walter Scott wrote about in The Lady of the Lake, one of the seminal works of the romantic movement. All across Europe the rationalism of the Enlightenment was replaced by a preference for emotion, for the gothic, for the natural world. The land of the Scottish Highlanders, who had only recently been declawed by the British army (or rather, reclawed in the service of the Empire), was ripe for rebranding as a thrillingly - yet safely so - wild natural wonder. The tourists came in droves, and handsome facilities were built for them in the middle of this wilderness. Today the Trossachs is an area that your granny might come for a bus trip but not one, Ben Ledi aside, your hardy Scottish mountaineer would want to be seen frequenting. The reason for this is that it is right on the edge of the Highlands. For the Victorians, this was novel enough. But for us today, the area is known as the Highlands in miniature. With the full size Highlands just another half hour's drive away - why not go there instead? and had been to more spectacular hill ranges - like Glencoe and my home peaks of the Arrochar Alps - before visiting the Trossachs. I was sure there was something special here, but despite a number of visits, I couldn't quite find it. You don't see it from the roadside, nor from climbing Ben Venue or Ben Ledi, nor from strolling to the falls of Leny or Bracklinn, or from visiting the Rob Roy Experience in Callander. The compelling essence of the Trossachs was hidden. Until recently. 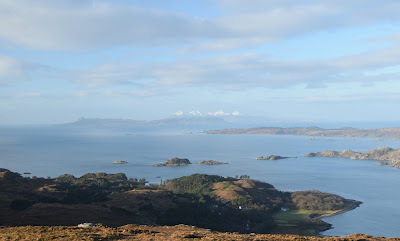 A trip to Ben A'an was to open my eyes. Ben A'an, a miniature peak, easily accessible from the road, was to be my first hill since damaging my knee at the end of this May. The steep path through the forest is carpeted in leaves, of beech, oak, alder. We stopped to listen to the creaking of the slender trunks, the swaying of the crowns in the wind, the larch needles drifting down like snowflakes. Unfortunately a cloudburst took it upon itself to arrive, and views were largely obliterated by the rain. This would be a magical viewpoint on a sunny autumn day. My knee felt OK, some clicking apart, after this small hill. I wanted more! Why not wander the shores of dark Loch Katrine, with its well-made hydro road? Our walk terminated at a point called Ruinn Dubh Aird, where the view opens up and you can see up and down the loch. A discrete circle of inscribed slates invites you to stand in the footsteps of the poets, and to contemplate your own response to the landscape, make your own romantic art. I had never walked along Loch Katrine before, and this place was a revelation. The pictures don't do justice to the area, surely best in autumn sunshine. I felt moved by the beauties of nature. Finally, I had caught a feel for the essence of the Trossachs.